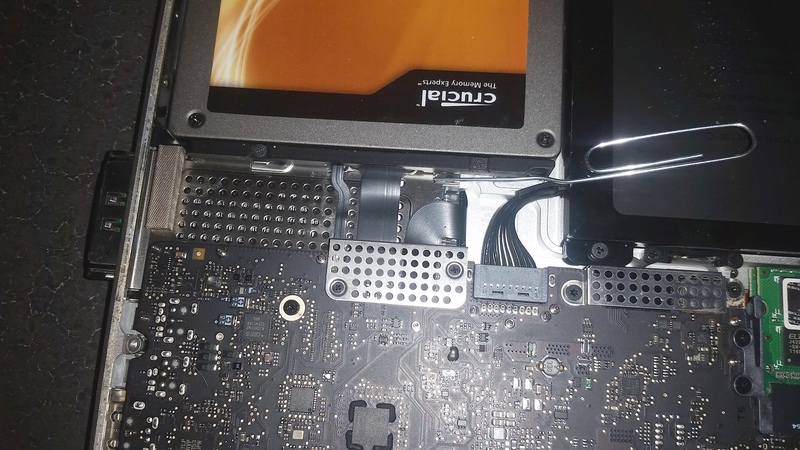 I got an ExpressCard stuck in my MacBook Pro, Late 2011 model. There wasn’t anything accessible from the outside that would give me purchase with a pair of needle nose pliers. I solved this problem by removing the screws on the bottom of my MacBook, then gently pushing the card out 1/4″ with a bent paperclip as shown in the photo above. Then it was a simple matter of pulling it out with my fingers. Simple! February 2018 update: This adapter still seems to work for me in 10.13.3 using Sonnet’s latest driver. November 2017 update: Martin wrote in below to share that this worked for 10.12 as well. 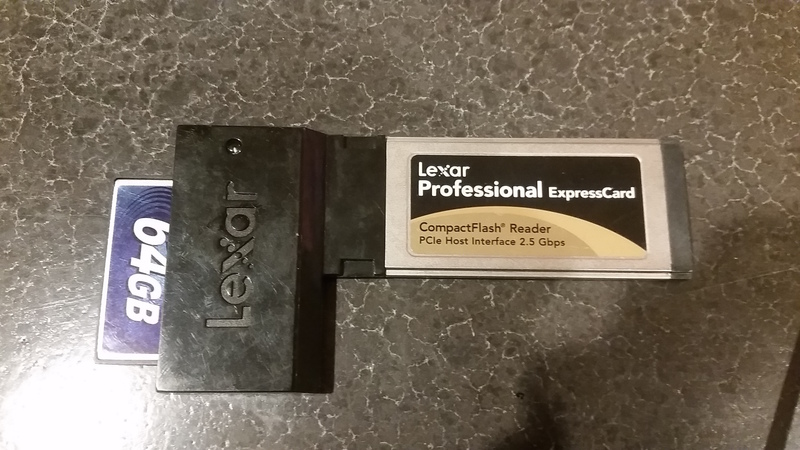 I have a Lexar Professional ExpressCard Compact Flash Reader, model number LRWEXPP-7000. Lexar’s latest drivers do not work for MacOS 10.10 and 10.11 because they way they must be installed has changed. However, Andrew Jung, a reviewer on Amazon, left a very helpful tip on the product’s page a few days ago. Read on for a possible solution. I met Ben Katz of Etchstar.com–home to engraved iPods, engraved MacBooks, and other awesome custom electronics–at a recent LA tech meetup. He handed me an awesome all-metal business card, and we struck up a quick conversation. 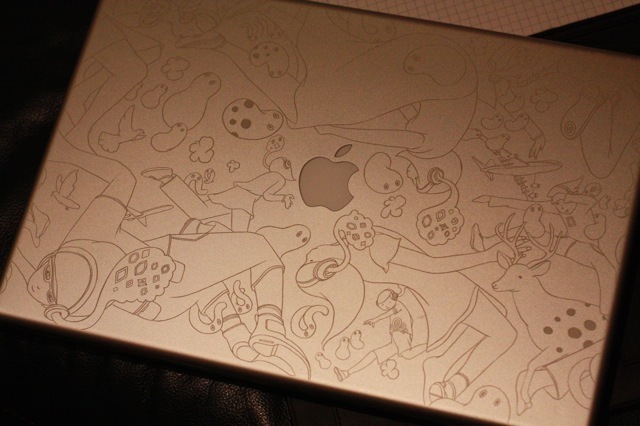 I went through PCP’s illustration file and tested a few images in B&W on the engraving template. His “everyday is sunday, baby” print really resonated with me, and seemed like it would look great on the MacBook Pro. I reached out to PCP who offered to give me permission to engrave and send me the B&W line art if I bought the print. So I did! The B&W line art looked great, and with a couple of minor changes I was able to line it up on the template perfectly. A quick call to Ben got me a 6:00 appointment at Etchstar, where Bill and Denny prepped the file in CorelDraw and sent it to the laser. 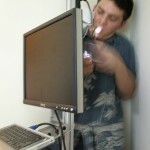 I expected to be more anxious about handing over a $2,800 computer to folks wielding a Class IV laser, but the team exuded competency and confidence and I had no reservations whatsoever. The process took about 40 minutes, but, boy, am I thrilled with how it all turned out. Check it out! Mishima is a 15″ PowerBook G4 that met an untimely demise when my cat Lilo knocked it off a desk… face-down right onto a lead-acid battery. The LCD display was irreversably damaged, a few keys popped off, and the case was cracked a bit. I replaced the keys from a spare keyboard, opened up the machine, and gently removed the screen assembly. 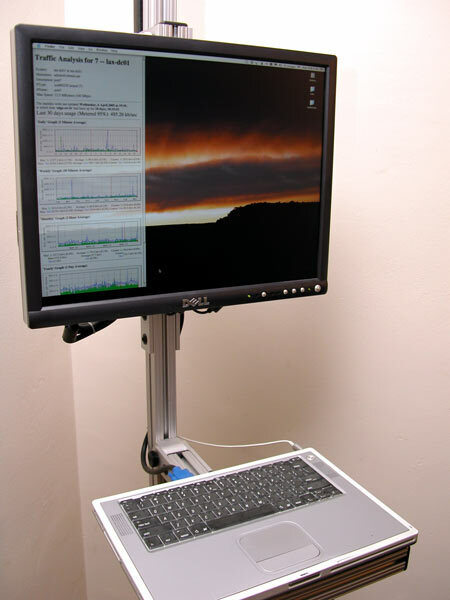 I procured a Dell 2001FP 21″ LCD display from a friend. 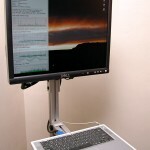 I then designed a custom stand using heavy-duty extruded-aluminum structural framing and machined a VESA-compliant mount for the LCD display. I put it all together to create a standing “digital hub kiosk” that provides a source of music, a dashboard for my morning rituals (traffic, mail, etc), and a display for one of my server’s traffic graphs. The design is stable and did not require drilling into the floor or ceiling; the unit is “wedged” in with high-grade neoprene rubber bumpers at the top and bottom for traction. 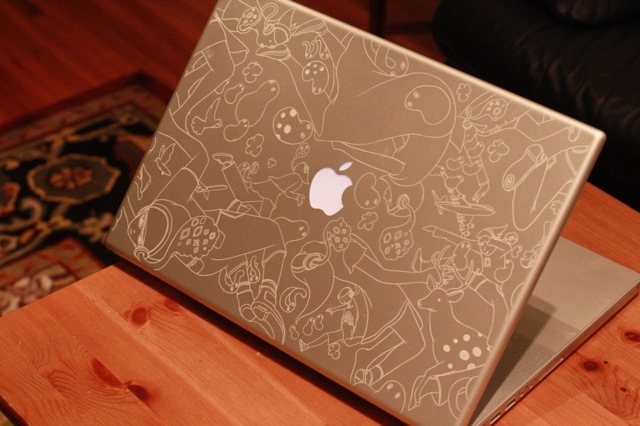 Not a bad use for a broken laptop! 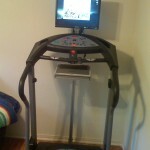 In 2009, I moved Mishima to my exercise room at home where she can now be used while walking on a treadmill. 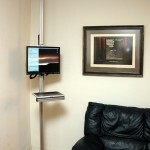 The screen has been upgraded to a 24″ widescreen LCD, making this an ideal setup for watching DVDs while exercising.